In the last chapter, you took a deep dive into the Azure cognitive offering QnA Maker service. We discussed what it is all about and why it’s being used, and then you created a QnA Maker service using the Microsoft Azure Portal. 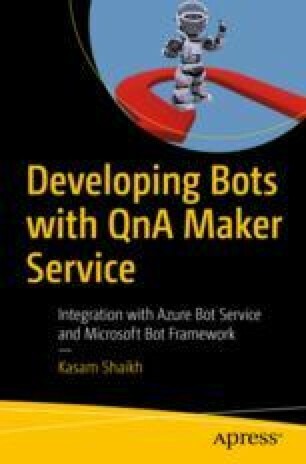 In this chapter, you use this QnA Maker service to create a content backend for your bot or application, called the knowledgebase.